My apologies in advance for yet again reviewing an exhibition that has already concluded, but yet again this exhibition was too good not to acknowledge. “Water Women” combined the talent of 5 female artists having met in the creative environs of Newcastle TAFE Art School. I admit to being familiar with 3 of the artists’ work however it was a pleasant surprise to discover new work from 2 unfamiliar names. I’ll begin with Emilie Tseronis whose work I have admired for a number of years now and have seen exhibited in many a venue including a shop front in the quiet town of Hawks Nest. Her inclination to experiment always makes for an exciting trip to a gallery. 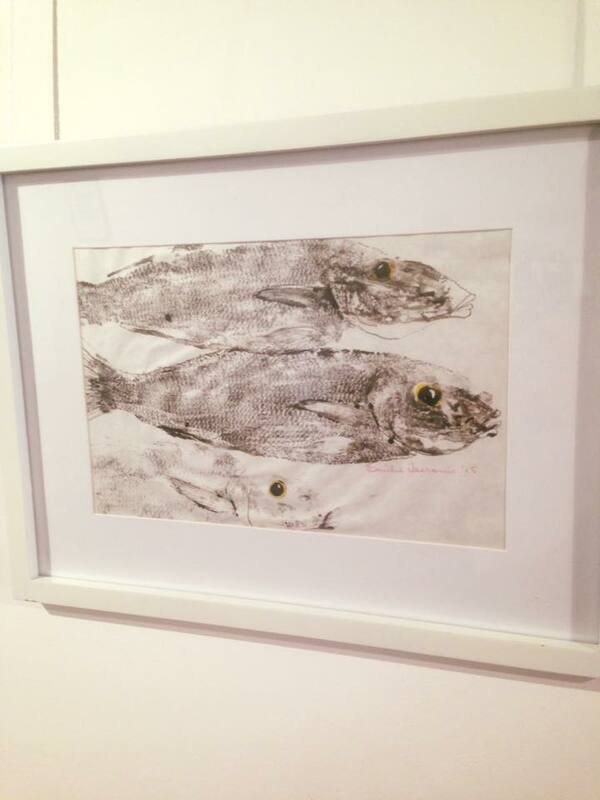 In this exhibition fish become still and subjected to scrutiny. These studies reflect on the beauty yet transient worth relegated to these humble specimens. The work of Mel Baldwin is often reflective and peaceful. I am thinking of her serene streetscapes devoid of life however brimming with pathos. Her particular mode of transferring paint to canvas is attractive and pleasing. Her large painting in “Water Women” seizes that moment where the sun is hidden behind a papery thin wall of cloud allowing the reflection from the receding tide to glow with translucence. It is a perfect rendition of a relaxed instant where people are enjoying the retreating sun. But as much as I admire this painting I cheered when I saw this artist exhibit a simple vessel of water painted a number of times each showing differing plays of light. It’s experimenting with background and technique and yes I love this tendency to investigate and learn and be fearless enough to exhibit the results. Now for the last of the artists I am familiar with. Donna Hawkins was a student in my sculpture class back many moons ago and I must admit to not taking too much notice of her progress, or for that matter anyone else in the class as I was busy trying to manoeuvre various machines so as not to injure myself or any other person in my vicinity. Needless to say I wasn’t at art school for this subject. But getting back to the real sculptor here. It was not until a couple of years ago I realized the talent of this artist when I went back to the art school to see the student exhibitions. I happened to walk into the sculpture department and this is where I grasped the meaning of talent within this genre. 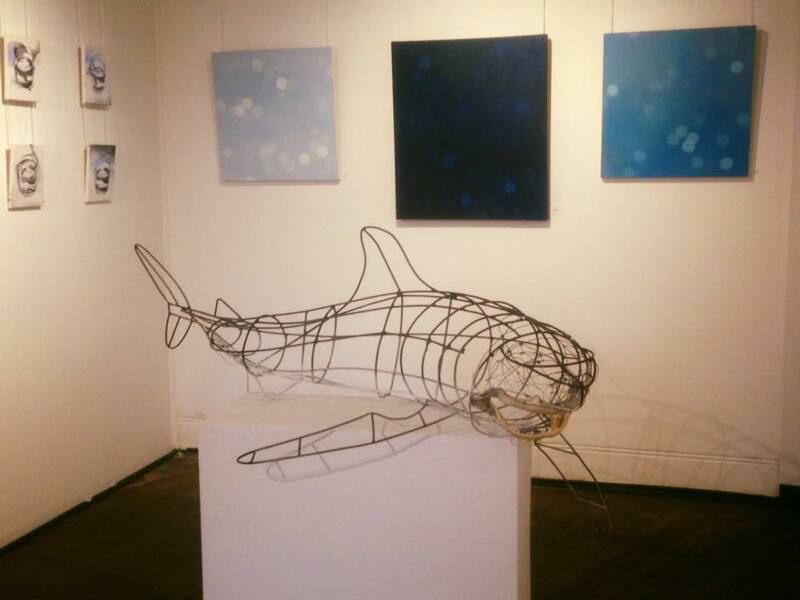 Her affinity with three dimensional was further reiterated in this exhibition where a shark was proportionally rendered in wire. Contrary to the properties of wire this sculpture described the creature in all its sleekness and fearsome beauty. It’s certainly an impressive work. Visiting the gallery Eden Art a couple of weeks ago I was instantly attracted to the painting behind the desk by Maggie Hall. The kettle as subject did not interest me at all. It was the paint application of course that had my admiration. Yes the image was floating and I know with shadow it would have been grounded but I think that misses the point. The painting was a lesson in the intuitive notion of the abstract, knowing the nature of the material and manipulating it to derive a personal form of expression. Although photography is the chosen medium of this artist I kept coming back to her painting style. Last but certainly not least is the ceramic artist Lynda Gibbins. Her exquisite flowers were brilliant and surreal. The combination of an informative eye, detailed analysis and obvious technical skill created these wonderful, colourful works of art. I imagine these superb flowers could evolve into ludicrous yet intriguing art works akin to the strange creatures of the reknowned artist Patricia Piccinini. Water Women was exhibited at Eden Art (formerly Four Point Gallery) from the 9th -26th July. I will be looking forward to seeing the work of these five fine artists in many more exhibitions. Wire Sculpture by Donna Hawkins. Looking forward to your next exhibition.